I have not since used it but to the eye it looks nearly untouched. Includes case and stand. Mint Condition. Only used once. Yongnuo Speedlite YN560 II. Condition is Used. Both slightly used, excellent condition. EX /LN Cond: YongNuo YN600REX-RT II eTTL Speedlight Check the hi-res photos of the actual item you will receive. Canon-Compatible 2.4GHz 15-Channel Radio Compatible with Canon E-TTL / E-TTL II Guide Number: 197' at ISO 100 and 200mm Zoom Range: 20-200mm (14mm with Panel) Tilts from -7 to 90° Rotates Left & Right 180° Wireless Master/Slave TTL Functionality Recycle Time: Three Seconds (Alkaline) High-Speed,1st & 2nd Curtain Sync Runs on Four AA Batteries It should come as no surprise with that name that this flash is almost just like the Canon 600EX RT II. But cheaper, and better in certain ways. Save a bundle and get this nearly LN version for even less! Google Cameragraphics and Auburn AL Locally owned and operated out of Auburn, AL. 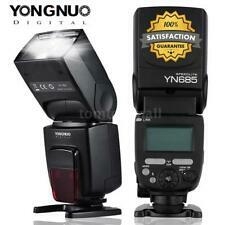 Yongnuo Digital Speedlite Flash YN-56EX ETTL For Nikon - DSLR TTL Mode - NEW! 2.4G wireless speedlite with high guide number of GN60. 1 Speedlite. Supports auto and manual zooming, and the flash coverage can be changed between 20~200mm. Flash Mode: E-TTL/M/Multi. Support sound prompt function, custom setting and auto saving settings. You can check out Younuo.USA for full features, otherwise a few are as follows. You can check out Younuo.USA (external link) for full features otherwise a few are as follows. • Flash Mode – ETTL /M / Multi. 1 x Mini Stand. 1 x Protecting Bag. 1 x English User Manual. Advanced Application:5. High-speed continuous shooting. Rear-curtain Sync. Reflection Flash. Excellent near mint condition. Acquired in an estate sale. Appears to be new or never used. Being sold as is. YONGNUO YN-568EX II 4-Channel TTL Flash Speedlite. (this unit may have a few signs of wear and tear but does not affect the functionality of unit). Carry Pouch. 3 YONGNUO YN560 IV flashes with the YN560-TX wireless controller in good used condition. Some marks from normal use, nothing major. One of the battery doors won’t fully close, a piece of gaffer tape does the trick though. No rust or corrosion from batteries. This is a great kit for a beginner looking for a „strobist“ setup on a budget. Yongnuo Speedlite YN-460 Shoe Mount Flash . Used once or twice. Shipped with USPS Priority Mail. YN585EX supports FEC, FEB, Rear-curtain Sync and Red Eye Reduction. YN585EX is equipped with AF Assist Beam. TTL flash with High Guide Number. GN58@ ISO100，105mm；supports TTL, M and MULTI mode. Supports auto and manual zooming, the flash can coverage can be changed between 20~ 105mm. Yongnuo Digital Speedlite Transmitter. Condition Pre Owned. Comes With Box, Cables And Pouch. For Canon 5 & 6 D. Tested And Digital Screen Lights Up. Takes 2 AA Batteries Not Included. Sold As Is. Box has Some Issues Due To Storage. Please Look At Pics And Decide For Yourself. Thank You For Looking. Selling a used Yongnuo YN-560III. I've been using this for my off camera flash. I'm selling it because I have a new lighting system. 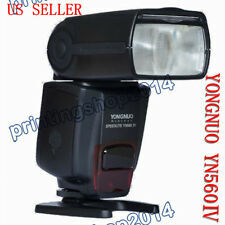 YONGNUO TTL Speedlite Flash YN-568EX II for CANON camera ---- Barely used. Manual Yongnuo YN560-ii in excellent condition. Yongnuo YN560 IV Flash Speedlite is a combination of YN-560 III and YN560-TX. 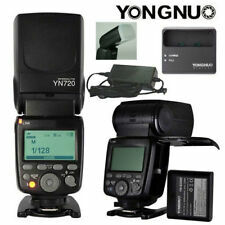 The latest Yongnuo manual flash, an upgraded version of YN560 III. Great choice for multi-strobe setup for studio and on-location shooting. OPEN BOX YONGNUO YN-E3-RT II SPEEDLITE TRANSMITTER. SLIGHTLY USED YONGNUO YN600EX-RT II FLASH FOR CANON.